It’s here, sized and I’m very happy. I normally like 40mm and below for my approx 6.75 round shaped wrists but as I suspected it wears similar to my Oris 65 which is 40mm. Lug to lug is about the same. Height is 1mm less than the Oris. Both watches wear relatively thin due to a slim case side profile (GMT curves a little more to hug the wrist). I would say visually the GMT looks a touch smaller than the Oris probably because both have narrow bezels but the GMT is stainless steel (vs Black Oris bezel). As others have already stated, it is ok to set the GMT hand between 10pm and 2 am. I would just be careful if you do it, because it is easy to forget whether you should turn the crown clockwise or anti-clockwise and if you turn the crown the wrong way without thinking, you could inadvertently change the date. Thanks. Yes this seems like a quite easy error to make if you don’t often use the GMT function. 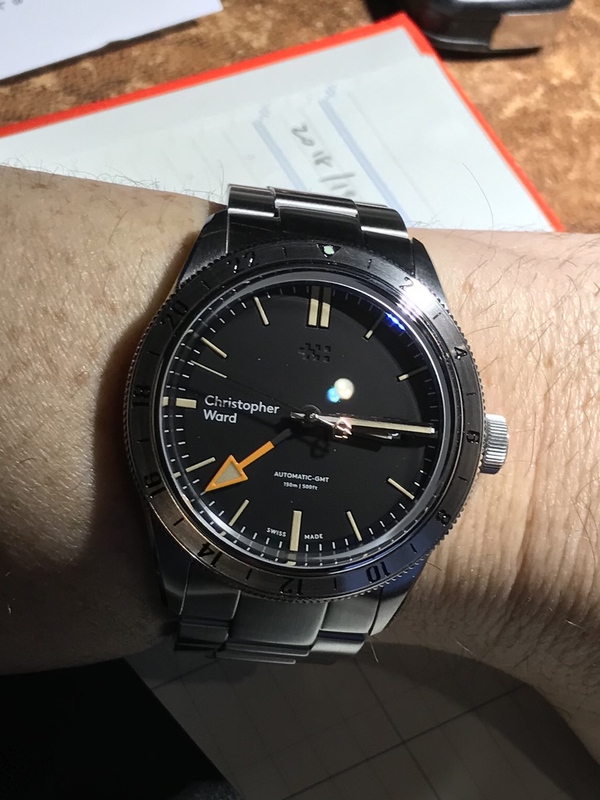 It’s stated in the description that this C65 GMT is able to track 3 different time zones simultaneously. Could anyone please explain how is it done? By looking at the dial, I can only get 2 different time zones. One from the hour hand, and the other one is from the GMT hand with the help of 24-hour bezel. The front page states that all Tridents have a 15% off promo with the code "Gift15", for this weekend. However, when I enter the code (with a Trident in my cart), it states the code is not valid. Anyone else have this problem, or know of a workaround? Thanks. I saw a Rolex GMT in a shop window the other day (as pictured up thread) and quite frankly it looked a little sad. I know some will feel a chill in their water that being said about Rolex but the C65 Trident GMT version seems like a much better looking watch, IMHO. And generally I like Rolex. You need to enter the Gift15 in the Promotional code box, not the Voucher code box. ^^^ That makes sense, but if you have a rotating bezel, it would perhaps be a little more ideal to have 24hr markings on the dial as well. That way, you could have 3 permanent timezones that are easily read. As it is, the 3rd is only really a temporary thing because moving the bezel makes reading the 2nd too complicated at a glance. Ordered mine last month and happy to say it has now entered the country. I am looking forward to having it on my wrist soon! I did. It’s not working for the watch shown in pic. It does work on GMT version. Not good! The 125xmas18 code works for the C65 and is nearly as much discount as the gift15 code on a $865 watch on the USA site. The xmas code is good until December 24th I think.